HONOLULU (HawaiiNewsNow) - Talk about a well-deserved retirement. On Thursday, Emma “Lindy” Napolean was honored for 52 years of civilian service with the U.S. Army ― and then sent on her way to enjoy some much-needed down time with her husband, a retired Army sergeant major. During a ceremony, Napolean was also presented the Superior Civilian Service medal for exceptional service to the Army. Napolean was born in the Philippines to Army parents and became an Army civilian in 1967. She started out as a clerk typist and worked her way up to become an executive assistant at different Army posts across the nation and overseas. 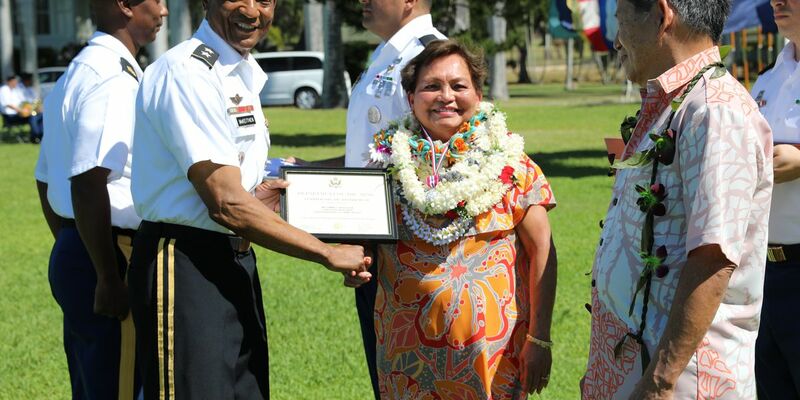 In 1989, she began service in Hawaii at the U.S. Army Pacific Headquarters in Fort Shafter. She was then promoted to executive assistant to the commanding general after two years. Her work involved keeping track of schedules, writing correspondence, providing guidance and leadership to soldiers and was the “heartbeat” of the general’s office, the Army said. In Hawaii, she has worked for 11 commanding generals, 30 executive officers to the commanding general and 22 aide-de-camps ― or personal aides to the commanders. They have five children and nine grandchildren. Napolean’s big plans for retirement: She wants to travel more.